Vacation rental house. Sleeps 8, 4 bedrooms, 3 bathrooms. Dogs allowed. 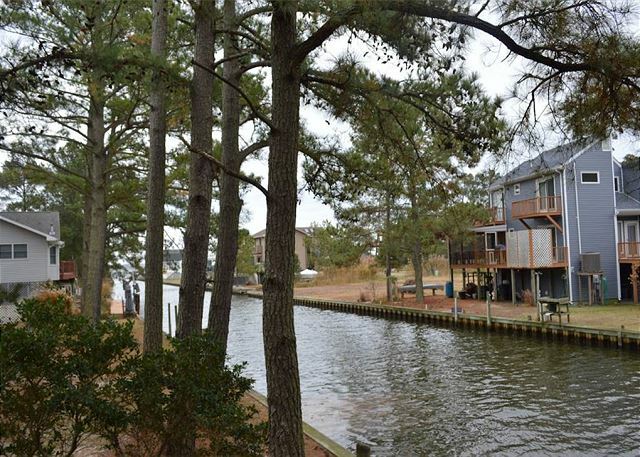 Contemporary 4 bedroom 3 bath Waterfront home. Pet friendly, located in a private area off North Main Street. Offers 2 master suites with waterfront balconies. This home does not disappoint with its vaulted ceilings and gas fireplace. Offers a well-equipped kitchen with stainless steel appliances. Keurig and Standard Coffee Maker, Sit back and enjoy the screened gazebo overlooking the water. Garage access to store all your beach equipment, bikes & kayaks. Nearby is Assateague Breeze, Sir Robins Retreat & Herons Haunt. Prime & Off Season Rates: $1850 weekly/$370 nightly.